That’s kind of a mouthful! 🙂 An extremely tasty mouthful, at that! 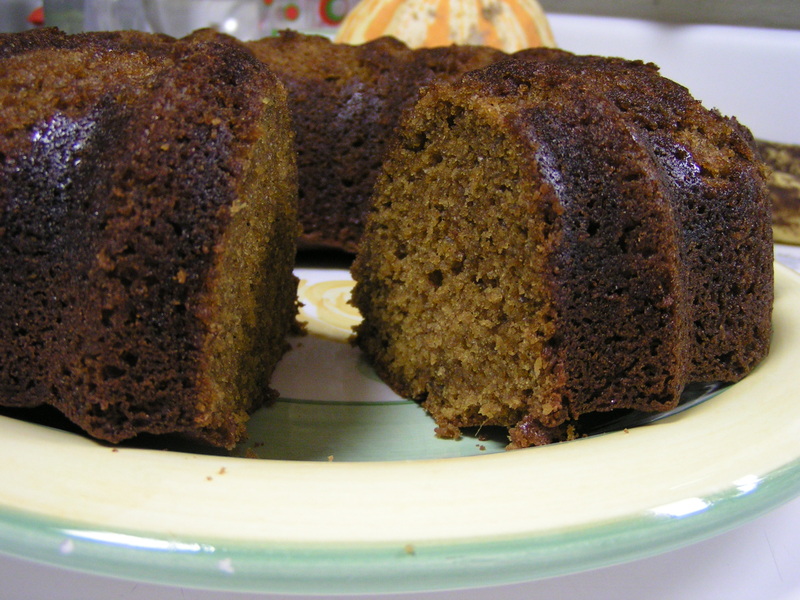 I actually made this cake twice, as the recipe also suggests a bundt version. This cake is NOT a lie. It was an excellent excuse to buy that bundt pan I’ve been eying for the last month or so. Fall just seems like a very bundt-y time of year. Especially with pumpkin. 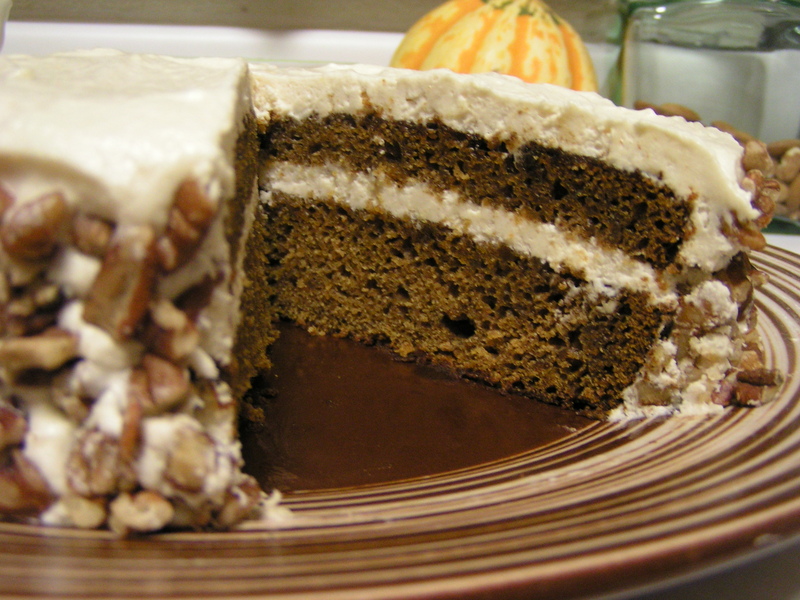 The list of ingredients is relatively short for the amazing taste of this cake! One of the best things I’ve invested in so far has been a digital scale. It’s the red thing hanging out on the right, under the brown sugar. I’ve been really amazed at the lack of standardization in quantities and weights of prepackaged ingredients…butter, for instance. While every stick says it is 1/2 cup, they weigh anywhere from 3.5 to 6 ounces! That’s a big difference when baking. Room temperature is suggested for butter, eggs, and other ingredients from the fridge. I’m finding the term ‘room temperature’ is pretty subjective. Does it mean winter or summer room temp? Texas room temp? Mum’s house (around 80F), or mine (around 70F)? I’ve decided what it really means is that the ingredients need to be soft enough to mix and emulsify well, but not so soft that they are liquidy and soggy. Creaming the butter and sugar creates little air bubbles, which in turn, make the cake or muffins or whatever lighter and fluffier. In a small bowl, bet together 2 eggs and 1 tbsp vanilla extract. 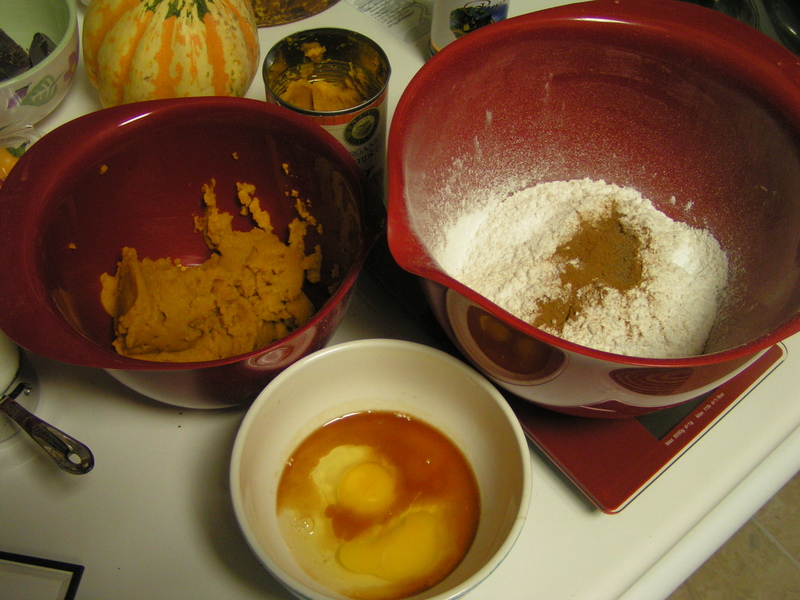 In another bowl, measure out 1 can pumpkin puree. 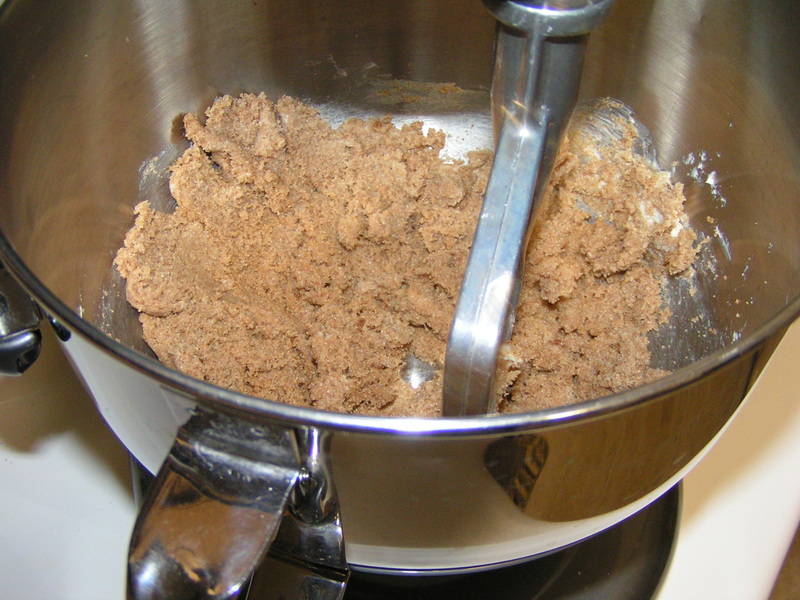 In a third bowl, sift together 2 cups cake flour, 1 tsp baking soda, 1/4 tsp baking powder, 1/4 tsp salt, 1/2 tsp ground cinnamon, 1/2 tsp ground allspice, 1/4 tsp ground nutmeg, and 1/4 tsp ground cloves. Set out 1/2 cup buttermilk so it warms a bit to ‘room temp’. First, add the egg mixture to the creamed butter sugar mixture, 1 tbsp at a time, letting it become fully incorporated before adding the next tbsp. Stop about halfway through, and scrape down the sides of the mixing bowl. 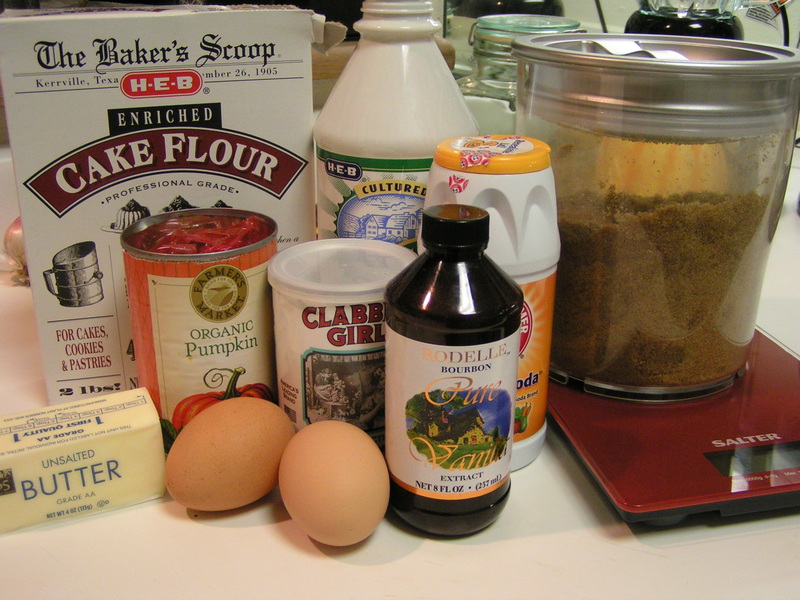 Then, alternately add the flour mixture and buttermilk, starting and ending with the flour. Allow ingredients to incorporate between additions, and stop to scrape the bowl at least once. 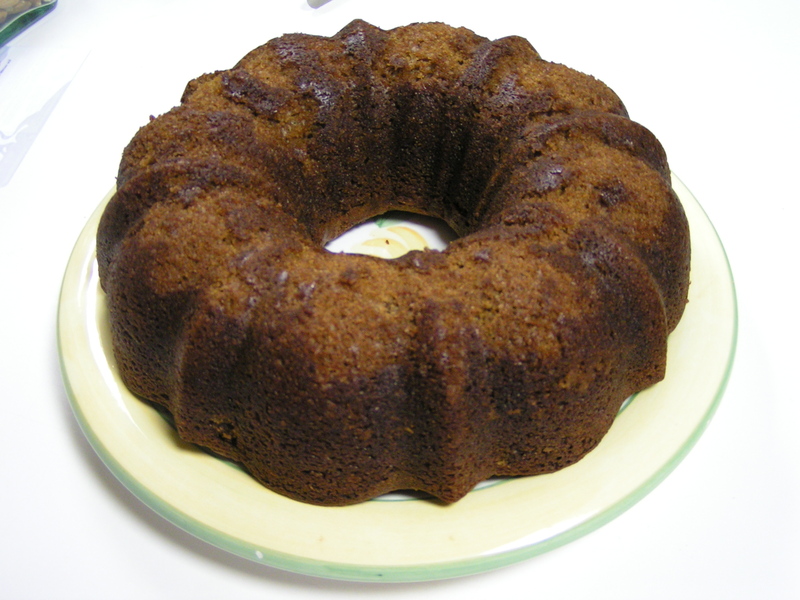 For the bundt, just spray the pan with non-stick of your choice, fill and bake at 350F for abut an hour. For the frosted layer cake, spray a 9 inch round, then line the bottom with a cut circle of parchment paper. Again, bake at 350F for about an hour. To make the frosting, toast 4oz pecan pieces. Blend together 12 oz cream cheese, 3 oz butter, 1/2 cup maple syrup, and 1 3/4 cup sifted confectioners’ sugar until smooth and fluffy. Use the best maple syrup. Not the stuff that is really coloured corn syrup, but the real stuff that comes from trees! I get mine from Whole foods, in the bulk isle, and it’s really pretty reasonable that way. 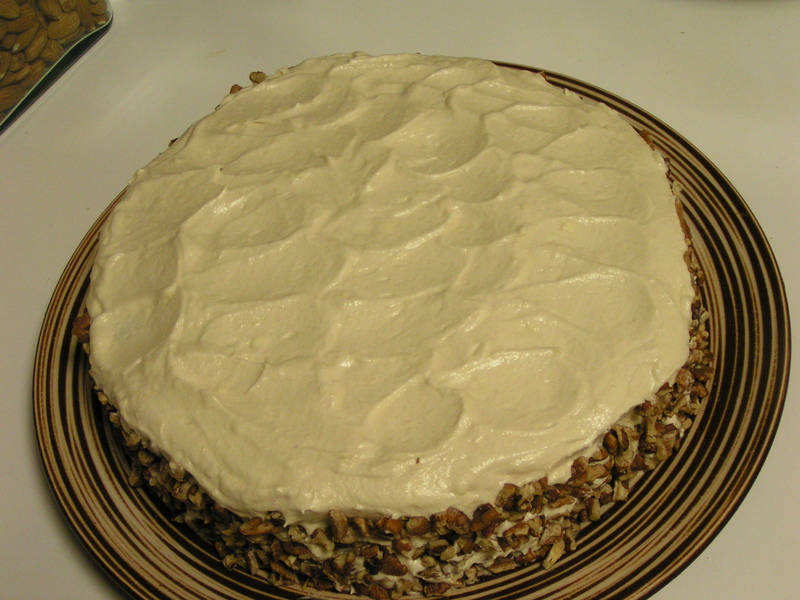 Unmold the cake onto a cake flat or tart pan bottom, leaving the parchment paper on the cake. Level if necessary, and then slice the cake into tow layers. 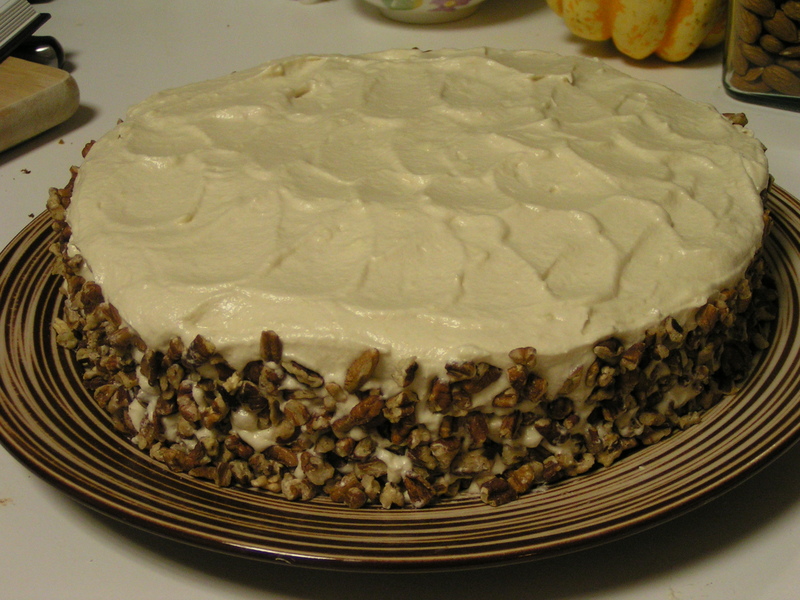 Place the cake’s top layer onto the serving plate, cut side up, and frost. Flip the bottom half onto the frosted part, parchment paper side up. Peel off the paper and frost. 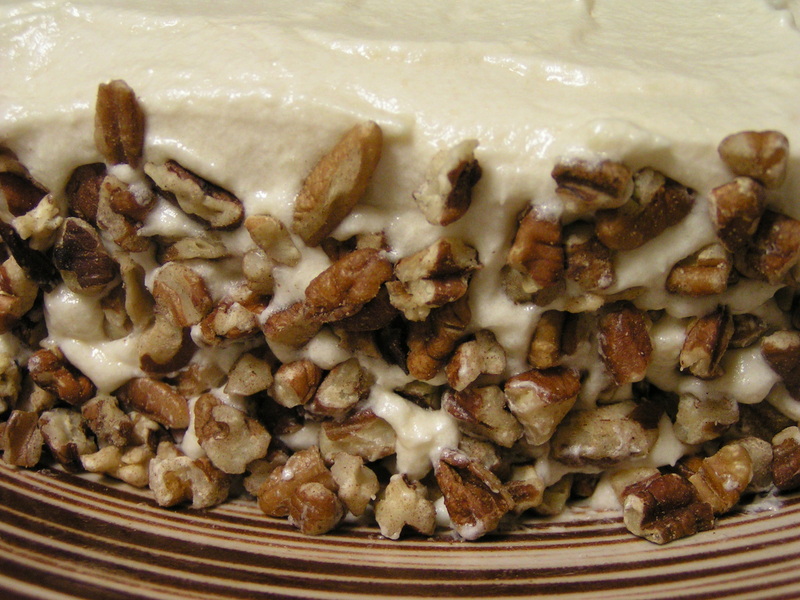 Press the toasted pecans into the side of the frosted cake. Use a teaspoon to create swirls on the top. Now it looks like something from the bakery! No action photos, though, as it was almost 2AM! I didn’t get the two layers quite even, but it still looks great, and tastes awesome! Since it has cream cheese in the frosting, I refrigerated it overnight, but it tastes better served at room temperature…whatever that is! I would love to make mini loaves of this for Christmas, too! Mini loaves sound awesome! I had enough frosting left over to do two mini loaves in addition to the cake. Or one, if you make it a layered mini loaf!